Its aim is to perform structural tests on blades in agreement with the IEC TS-61400-23 Standard (characterisation tests on physical properties, static and fatigue tests). 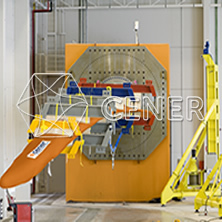 It has two test positions designed for complete blade lengths of up to 75 metres to perform static and fatigue tests, as well as static tests on blade sections with a nominal length of up to 100 m (9 MW wind turbine). Determination of basic properties: mass, centre of gravity and moment of inertia. Determination of bending and torsion stiffness. Extreme load and resistance tests. Multi-point and multi-axial accelerated fatigue tests on flap and edge.